I spent the day yesterday thinking it was Wednesday!!! Dont have a clue why but that is just how my brain is or isn't functioning at the moment, so while I thought I still had plenty of time to prepare for the weekend photographing the Welsh Pony Show in Rochester, I in fact didnt!! 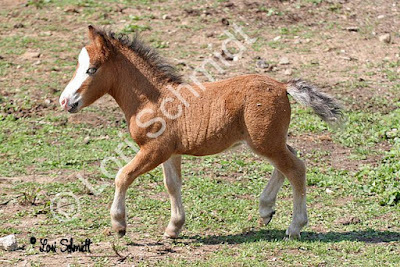 Herbie is only 2 and a half months old but is a very busy curious and rambunctious colt and his poor mother is really feeling the pressure. He is eating so well and yesterday I just decided that in order to get his little mind occupied it was time that he learned to socialise with other horses so that when I wean him from his mother he wont be like Taxes and Goldie were being only babies and unable to socialise with the bigger horses because I was worried they would get hurt. His arrival with his mother in the field got all sorts of activity going, I put him with Gee and Goldie because I felt they would be the best to start them out with and Sonny protected her colt beautifully and we had no mishaps and it quickly got to the point where she realised, hey this is cool, that little monster that is always biting me and jumping on me has something else to keep him occupied because he headed straight for the other mares. 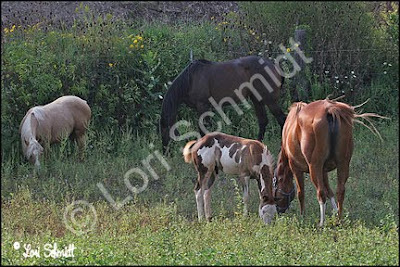 They were very gentle with him and Sonny had a nice break from his attentions and didnt seem to mind that he was on the other end of the field from her just glad of the peace and being able to munch grass. Blogger as usual has posted the pics in reverse order so the one below is of Herbie when I first put him out, the one below is when they all got racing around, it is so cute, Gee always lets Goldie win LOL, now and again she will stretch out and run the full length of the field and outpace her by miles, the 3 on the other side of the fence are Cat, BB and Wiggle. 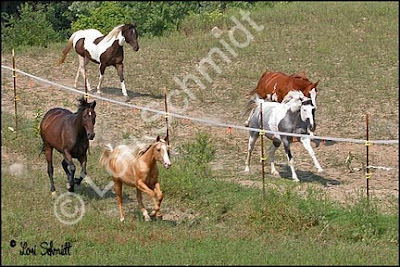 The first pic is of them when Sonny first started letting the other horses get close to her baby, she only chased them off once then just let him do his thing and he thought he was just the main man. A few posts ago I posted a pic of a butterfly crysalis that was just ready for the Monarch Butterfly to emerge. I took the crysalis pic and had to go out for just over an hour and this is what I found when I got back!!! 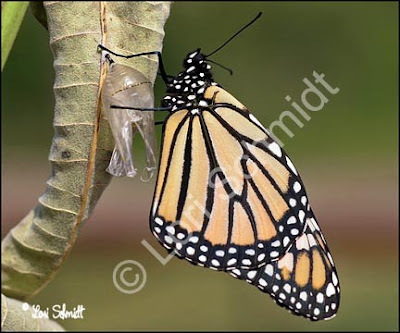 The butterfly had completely emerged and dried its wings the works, I missed documenting the emergence. Anyway here is the little butterfly that came out of the crysallis, the second pic you can see its clear cocoon/crysalis right next to it. 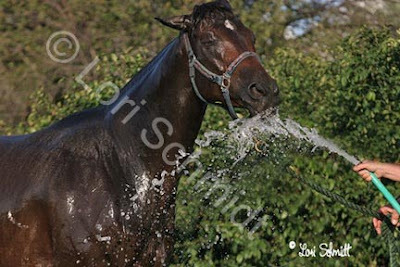 Gee loves water and she drinks from the hose, wish I had her with her lips going drinking it but she loves a bath too. We finished baling and putting the hay up in the loft at 9.15pm last night!! 198 bales. Stan and I were on our own for this one and even though I did the driving of the tractor during baling it was still very tiring and hard on my back. We took this hay to Stan and Val's house (the guy who normally bales it took 108 so we only had 90 - 66 bales from that field and 24 from another small field that we did at the same time - to put up) and Stan has bought an elevator to get the hay up into the mall of his barn which is much higher than ours, so I had to lug it onto the elevator so it could go up where he caught it and stacked it at the far end of the barn. Who needs a sauna, I can tell you I was dripping by the time we were done, but really pleased that we got it done I am getting some of my stamina back at last. Needless to say I slept very well last night LOL. It could have been worse we thought we would get about 300 - 400 bales and misjudged thank heavens, we would have been out there until midnight! Must check if the tractor has headlights LOL. I am on a roll what can I say, now all I have to do is catch up on my fellow bloggers' blogs as I am seriously behind with my reading too. A few weeks ago I got my favorite thoroughbred back to board. I dont know if any of you will remember Gee. More to come on her later but here she is eating her hay this morning out of the hay feeder in the field, she has become great buddies with Goldie and considering that she is about a foot taller than Goldie it is an odd couple indeed. 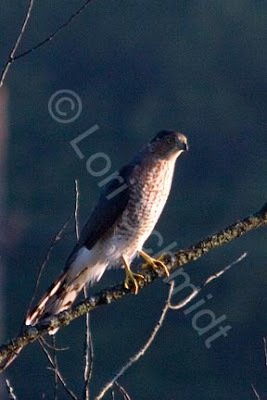 Also taken this morning is a shot of a Coopers Hawk (?) which I saw in the apple tree in the field early this morning as the sun was coming up. Not great quality on the photo as the sun was only catching the bird from the one side as it was very early and he was pretty far away, I tried to get closer but he caught on and flew away. He came back in about 15 minutes but caught me again and I didnt get a chance at another shot. He was eyeing the birds in the bush in my front yard and was perched on one foot until he saw me which is when I shot this shot and then he was gone. I have some of him on the one leg but the quality is not very good. The small birds of course were all atwitter which is what first caught my attention to the fact that something was going on outside. 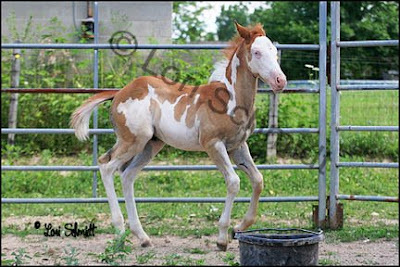 I took these a few days ago, this is Dosie who we sold last year but I managed to do a trade on one of my other horses to get him back because Michelle has always loved this horse and I wanted her to have him and I knew that Drew was looking for a brood mare to breed to a particular stallion and as they have had my filly Lori there since Larry passed, they had got to like her and her bloodline a lot so we did a trade. So in a way I cut down on numbers because I gave Dosie to Michelle so although he is still here she takes care of his needs and helps me a lot around the barn and Drew and Tanya cut back on one mouth too. That is Cat in the background and as you can see we had a small rainshower and the first thing they did was roll in the mud!!! Well we tried to bale hay last night because they were calling for rain this evening, but that appears to have been extended til tomorrow and the hay was still a bit wet last evening which would have caused it to mould, so Stan and I are going to get back to it at midday today and hopefully that will have been enough time for it to have dried enough to bale. We are looking at about 400 bales maybe a bit more so it is going to be a long day. It is also going to be in the 80s again which we need to dry the hay but makes it unpleasant to be doing physical labor in LOL (although truth be told poor Stan will be doing the loading and I will be driving the tractor and baler!). Oh well we can't win them all I suppose. 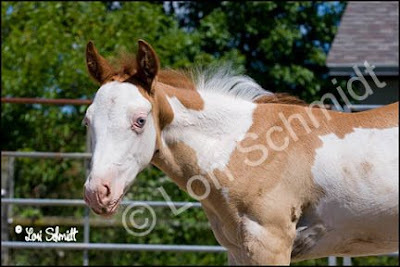 I have the Welsh Pony Show to shoot this weekend. Lisa is going to be coming with me and helping with the computer side of things and the shooting so it is just non stop. The Club put us up in a motel which is great so there is no running back and forth each day and we will leave Friday evening and come back Sunday evening. It is going to be a hot one then too so I should have a good sportsman's tan. The photos in this post and the last few have looked a little dark after I have uploaded them to blogger, let me know how they seem your end because if this is the case then I need to do some monitor calibrating because in Photoshop they look fine. Wow yep it is probably gonna rain or something (hope not though because Stan is cutting hay for us today) but I am here again. 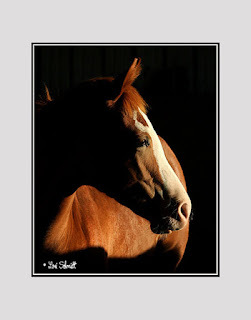 Was editing some pictures I took about a month ago when I went to the farm where I buy my horse feed from. 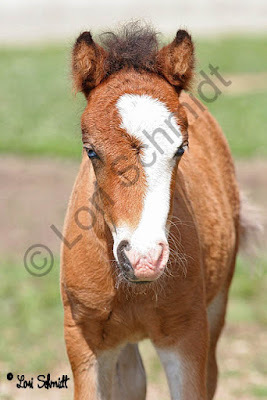 This little mini foal was 3 weeks old at the time and I fell in love with him. Busy busy as usual so will cut it short and get on with some work and hopefully pay the bills. Dont forget, if you like my photos, I am offering a very inexpensive way to have a small copy (trading card size) of them as collectors items which I am doing using my Etsy site or if you are looking for inexpensive gifts for you or family or friends please visit my Etsy shop at http://www.etsy.com/shop.php?user_id=6874447 here you will find all sorts of goodies from my photo trading cards to crocheted dish wash cloths (which I highly recommend as once you have used these woollen ones you wont use anything else). Yep I am still alive and kicking. 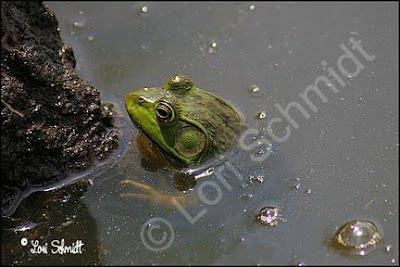 Crazy busy but thought I better post something, not my usual fare but I found these guys in the pond down the road yesterday. 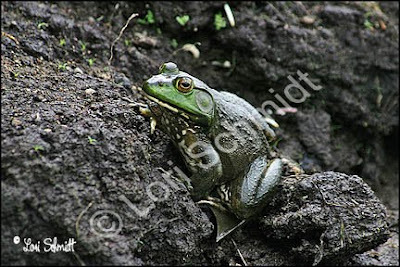 They all ducked very quickly when they saw me, the frogs gave me one heck of a fright as they chirp loudly like a bird when frightened!!! The turtles didnt make another appearance but I somehow managed to get this one shot of one coming up for air, they are so quick. Water must have been good and this guy watched me warily while I snapped off a few shots. 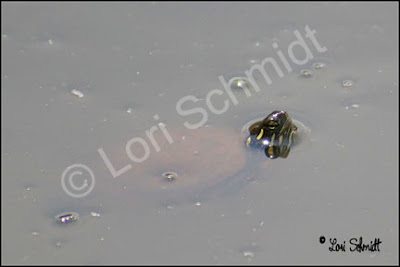 This last one also made a very brief appearance like the turtle but I thought it was quite cute LOL. 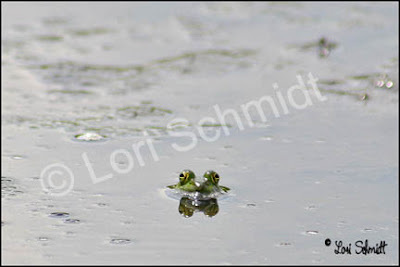 Hope everyone is well, I am having good and bad days, still struggling along but keeping my head above water (like these guys above!!). Where to start!!!! So much happening over the past 2 weeks. 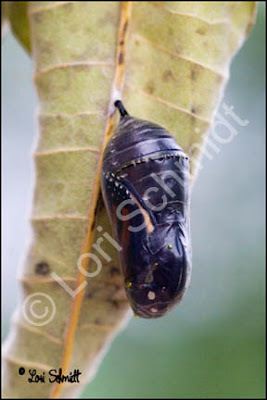 The photo is of the Monarch butterfly about half an hour before it started emerging from the pupa. I had to go out just after I shot this and when I came back an hour later there was a butterfly fully emerged, so I missed the whole thing!! Pics of that to follow. BB and Kendal won their class at the Indiana State 4H Show and got 3rd overall in the halter horse division!! Not a bad deal for their first year showing considering the first and second plkaced horses had been competing for a few years at least, the one was in her last year of 4H (18 years old). The judge and other exhibitors had nothing but good things to say about this pair. They just do each other justice. 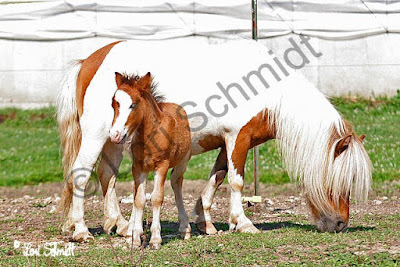 Unfortunately I dont have any photos as I was shooting a Pinto show while they were there but I have a few pics that Michelle and Kendall took but havent had time to edit them yet. The Pinto show was very hot and although not as successful as they hoped, it was a good weekend and enjoyed by all. 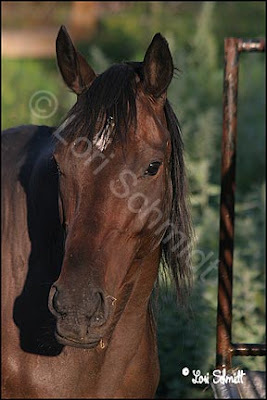 I am still trying to get the ordered photos out which will help with the bills tremendously!!!!! 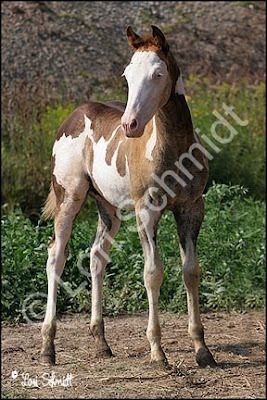 Annette sold another filly for me, Dawn one of the 3 year olds which is great and possibility of Taxes being sold too but probably at the end of the show season, everything is so crazy right now with shows every weekend that the people havent been able to come and look at him yet. 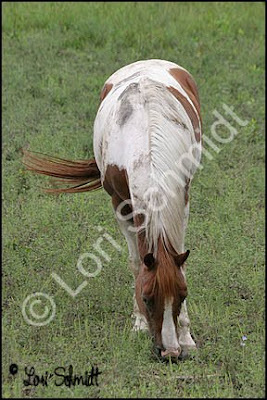 He is looking awesome, I will try to get photos of all the horses down the road soon. Other than that lots happening but I am starting to feel really human again and things are looking up, I hope it will continue this way. 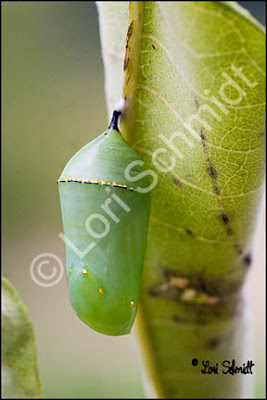 I have over the years collected photos of each stage of the Monarch Butterfly's growth and have never been able to get it in the pupa stage. Well this year I decided that when I saw the first caterpillar I would watch it until I thought it was a reasonable size then cover the plant or bring it on the plant inside and monitor it's transformation. In the past I have always seen the worms then they just dissappear and I have hunted and hunted for the crysallis to no avail. This is what it was looking like today, beautiful green color with spots of glistening gold around the top and bottom of it. I am hoping that I will catch it emerging. The transformation from caterpillar to the first stage where it turned green was so quick literally in the space of a few hours it had turned. I will keep you posted. 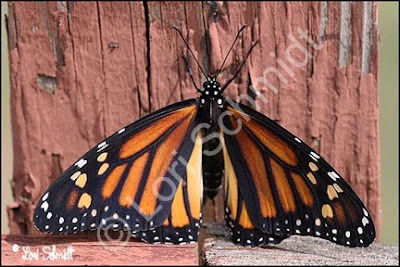 I have not seen many Monarchs around this year and this is the only caterpillar I have found so far and I have made a point of protecting the Milkweed plants which are their staple diet along our fence lines but I dont know if it is the mild weather or what but I have only seen one butterfly and one worm thus far. The next pic is of Herbie. 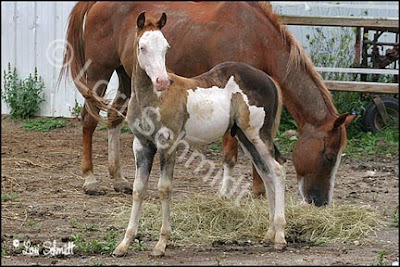 He is such a beautiful little boy, if you look on his right side the white pattern looks like one of Casper's beastly brothers with the sheet over its head and hands up and legs behind!! We still havent settled on a name for him but Michelle thought maybe Herbert's Spooktacular would fit him LOL. 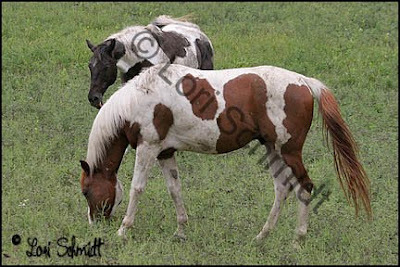 He also appears to be changing color from the sorrel we thought he was going to be to a black, or grullo. 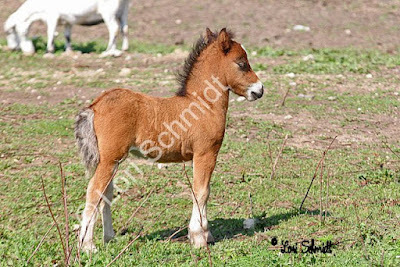 If you look closely at his hindquarters, his baby hair is shedding out and it is coming back almost black??? I will post a better one of it when it has shed out a bit more. I have been trying to get all of my paperwork sorted out. Stan got me a lovely carpet to put into my office and bedroom areas. While Larry was alive it was not possible because his wheelchair just wasnt compatible with carpeting and this piece although it is nearly 10 years old is in immaculate condition. The piece out of the lounge alone is big enough to do both of these rooms, so I have moved everything out of the back room that used to be the dumping ground and am making that into my bedroom and the main room where we spent most of our time which was the bedroom I am going to set up as my office with tables and computers etc. The only problem with this is that I have had to pile everything into my living room until it gets done and it may be a week or so before anyone can get to it!!! So in the meantime I am just going through stuff and filing and keeping what I need to keep and throwing what can go out away, a bit each day. If you like my photos, I am offering a very inexpensive way to have a small copy (trading card size) of them as collectors items which I am doing using my Etsy site or if you are looking for inexpensive gifts for you or family or friends please visit my Etsy shop at http://www.etsy.com/shop.php?user_id=6874447 here you will find all sorts of goodies from my photo trading cards to crocheted dish wash cloths (which I highly recommend as once you have used these woollen ones you wont use anything else).